The nation of Israel is tiny. From its southernmost tip to its northern border is only 263 miles. The inhabited portion of the country is much smaller than that. From east to west, Israel is only 9 to 70 miles wide. But interestingly, in Biblical times Israel was much smaller. If we exclude the northern kingdom of Israel, which was conquered and exiled in about 930 B.C., what is left is the area referred to in the Bible as Judah. The kingdom of Judah occupied the hills and mountains around Jerusalem. It was never able to dislodge the Philistines from the Mediterranean coast, and was therefore landlocked. 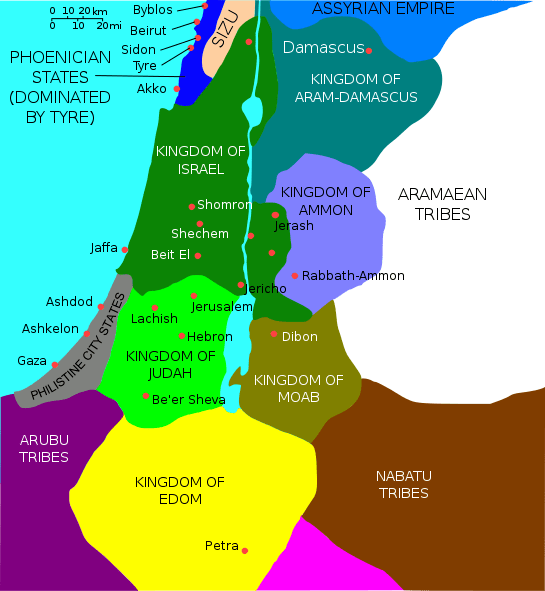 I couldn’t find a map of the region after Israel was destroyed, but the map below shows how small and isolated Judah was. Imagine a map of the modern nation of Israel superimposed over this. (Unfortunately I was unable to find one.) The fascinating fact is that modern Israel largely occupies land that the nation of Judah didn’t occupy, while the area that did comprise Judah is primarily part of what today we call the occupied West Bank. In Israel this area is commonly called “Judea and Samaria.” This map makes it easier to see why.